WHAT: The San Francisco Arts Commission Galleries (SFAC Galleries) is hosting the finale of its signature art scavenger hunt, Passport, on Sunday, October 21, 2018 in Hayes Valley/Civic Center. Now in its 10th year, this unique event puts the art collecting experience in the hands of the general public. 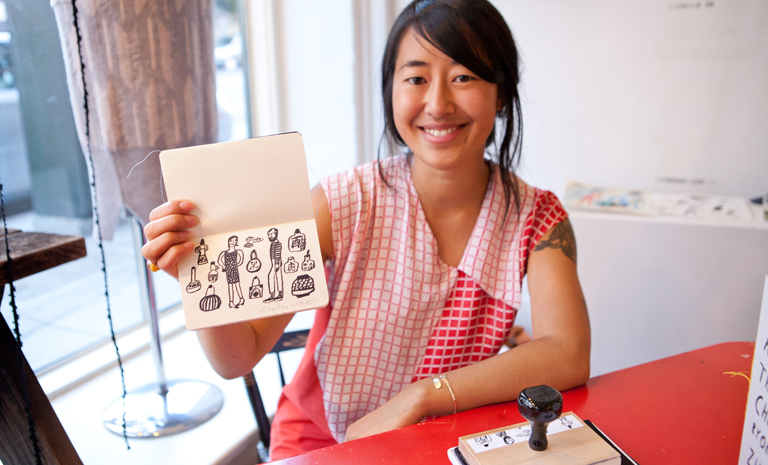 Local artists will be stationed in venues throughout Hayes Valley/Civic Center, and Passport attendees can “create” their own limited-edition artist’s book by collecting original, artist-designed stamps in a customized “passport” notebook. For this final iteration of Passport, SFAC Galleries will bring an estimated 300 do-it-yourself art collectors through a designated route to collect stamps from artists while also discovering the small businesses and venues that make the Hayes Valley/Civic Center neighborhood vibrant. Following the event, join SFAC Galleries for a 10th Anniversary after-party from 4 – 6 p.m. at the SFAC Main Gallery in the Veterans Building. Sixteen emerging and established artists/collectives will participate this year including: Craig Calderwood, Jeffrey Cheung, Michael Hall, Chad Hasegawa, Angela Hennessy, Jay Katelansky, Phillip Maisel, Alicia McCarthy, Gay Outlaw, Grace Rosario Perkins, Leah Rosenberg, Eli Thorne, Minoosh Zomorodinia, and a special stamp from the estate of René Yañez. Artists will stamp passports at a variety of unique businesses and organizations in Hayes Valley/Civic Center, including: African American Art & Culture Complex, Dark Garden, Doob 3D, Gather, The Green Arcade, Hayes Valley Art Works, Isotope, KitTea Café, Plants and Friends, Ver Unica, and more! The SFAC Galleries worked closely with the Hayes Valley Neighborhood Association to ensure that the entire community is engaged in the event. In addition to the Passport event on October 21, SFAC Galleries also presents a Passport 10th Anniversary Exhibition (through – November 17, 2018) at the SFAC Main Gallery. The installation looks back on 10 years of Passport, celebrating the neighborhoods, local businesses, and artists that have helped shape the event. Designed by renowned artist and graphic designer Brian Singer, the exhibition showcases every stamp from all ten years of Passport. SFAC Galleries has been able to support its mission of making contemporary art accessible to broad audiences through this annual event. In the past, Passport has engaged Middle Polk (2017), Chinatown (2016), Japantown (2015), The Mission: Calle 24 (2014), the Divisadero Corridor (2013), North Beach (2012), the Castro (2011), Hayes Valley (2010) and The Mission (2009); worked with over 125 local Bay Area artists including Barry McGee, Clare Rojas, William T. Wiley, Enrique Chagoya, Lawrence Ferlinghetti, and Hung Liu; partnered with over 100 San Francisco neighborhood businesses and venues and managed hundreds of community volunteers. WHEN: Passport Stamping Day: Sunday, October 21, noon - 4 p.m. Located in the heart of San Francisco's Civic Center, the San Francisco Arts Commission Galleries makes contemporary art accessible to broad audiences through curated exhibitions that both reflect our regional diversity and position Bay Area visual art production within an international contemporary art landscape. By commissioning new works, collaborating with arts and community organizations and supporting artist's projects, the SFAC Galleries' programs provide new and challenging opportunities for contemporary art to engage with a civic dialogue. The SFAC Galleries was founded in 1970 and is the exhibitions program of the San Francisco Arts Commission, the arts agency of the City and County of San Francisco. The San Francisco Arts Commission is the City agency that champions the arts as essential to daily life by investing in a vibrant arts community, enlivening the urban environment and shaping innovative cultural policy. Our programs include: Civic Design Review, Community Investments, Public Art, SFAC Galleries and Street Artist Licensing. To learn more visit, sfartscommission.org. The mission of the Hayes Valley Neighborhood Association (HVNA) is to promote a sense of friendly association and community involvement throughout Hayes Valley; preserve and reinforce the neighborhood’s cultural and economic diversity, historic character, beauty and architecture; and insure the community’s constructive participation in San Francisco’s governmental process.